Beautiful decor and happy smiles are everything their nuptials were about. 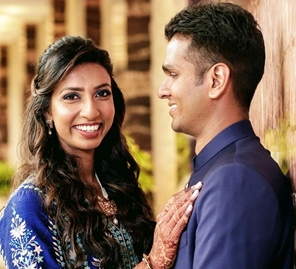 Garima and Vaibhav’s sweet love story led them to host a grand wedding. 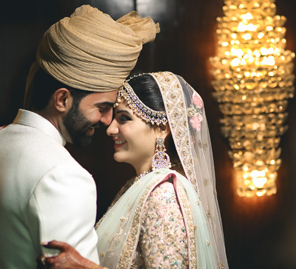 A palette of colors, a choice of themes and an array of flowers elevated their celebrations and their nuptials were shone with love and fine aesthetics. The bride shares pictures clicked by WeddingSutra Favorite Our Wedding Chapter and tells us their story. Vaibhav was my senior in B School and we then joined the same company - Hindustan Unilever Ltd. We worked in the same office in Delhi for about a year but barely ever spoke. When I moved to Bombay in 2016 he was here already and we happened to go out for a lunch with a friend. I found his company refreshing and I was attracted to a guy after a pretty long time. After that, it took us some dog farm/vineyard/hill station trips, Halloween parties, drives on Marine Drive, cooking and dining to realize that together, we felt happier and more complete, than ever before. He’s a thoughtful guy with a flair for doing things the right way. So Vaibhav planned to propose mid-air. We took a helicopter ride over Bombay and he presented me with my ring placed on sushi and asked, ‘Will you eat sushi with me forever?’ The funny thing was that all this happened on mic and headphones, so the pilot was privy to everything! We wanted to have the wedding in Delhi and across different venues. We booked the Belmond Hotel for the mehndi, haldi, baraat, and wedding. The cocktail party took place at Amaara Farms because we wanted an open space and lots of greenery. Both venues were great and the teams who took care of our wedding were very helpful and accommodating. Our wedding decor was by Hemant from Cocktail Decor. He built on our ideas and helped make them come together. His team was very involved and responsive. My makeup artist was Tejasvini Chander and she was exceptional! She really knows how to create a natural yet flattering look. What I loved was the personal attention – she styled my hair herself rather than leave it to an assistant and it was very artfully done. Moreover, she is such a positive and sweet person, it is great to have her around in the hours before your wedding. A place called Pink Ladoo in Chawri Bazaar took care of our wedding cards. We were looking for something simple, elegant and priced reasonably and that’s what our invitations turned out to be. My wedding jewellery was from Rambhujo Jaipur and my outfits were customized by a friend. We chose Our Wedding Chapter for our Wedding Photography and they really did a fabulous job capturing every single moment. We had two mehndi functions – one for the bride and the other for the groom. At mine, the décor palette was fuchsia, pastel green and white. We tried to mix traditional aesthetics with quirky elements, so imagine Rajasthani puppets and lots of kites. In fact, not only did we create an entire backdrop using colorful kites, but we also used them on the ceiling of the canopies. Vaibhav’s function saw a burst of bright yellows balanced by white. Here we didn't just stick with fabrics in solid colors but also used lots of white drapes with yellow motifs on it. Gendas, needless to say, were the flowers used here and the overall vibe was super cheery. We had our haldi by the pool and the decor made use of fresh colors. Turquoise drapes were used to create canopies while white sofas with peach and blue cushions dotted the lawn. These shades could be seen across other decor elements such as the flowers, the backdrops and so on. 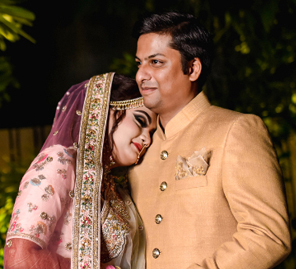 This one was a very special event and took place at a beautiful farmhouse in Chattarpur. The vibe was so relaxed and it was just about letting loose and having a good time. Even the food here was exceptional, and everyone had a blast! This one, hands down, was the most beautiful event we had. We had a French vineyard themed event and the entire space had been decorated wonderfully. Lots of fresh flowers, lush foliage and chandeliers brought the entire event to life. For the ring ceremony, our decorators had set up a decorated swing for us to sit on. We also had some performances by our family and friends for which we created a floral backdrop. Under the canopies where guests were seated, we created a ceiling that had vines suspended and glass chandeliers lit up the environs. We spent a lot of time ideating this setup and it was all worth it! For this ceremony, once again we had a peach, white and blue setup with elements that were decorated using white and yellow flowers. We had a small guest list for this function and the mood was very relaxed. We went with the elegance of white and gold for our wedding. We used lots of white drapes, bulbs that cast a golden glow and metallic elements to match the theme of the wedding. Our mandap was surrounded by golden design panels that also doubled up as candle walls. All of it looked amazing. We used rajnigandhas which added an incredibly delicate brilliance. 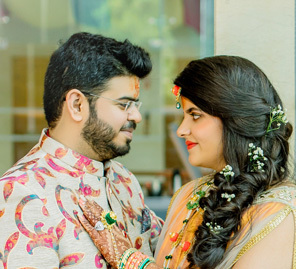 I wanted to wear the traditional bridal color for our wedding and so I opted for a red lehenga while Vaibhav wore a navy blue achkan.